In The Wall Street Journal today the ever-reliable Walt Mossberg reviews the first Google Chrome computers. Of course the first version ain’t very good, and they really screwed up on the pricing. But it is the future (or part of it, anyway). The theory is completely credible: Browsers now support all of the core functionality of desktop computers (directly or via “the cloud”). The cloud provides unlimited storage. Therefore the only software you need on your computer is the browser. Yes. True. But you also need an always-on, high-speed, secure and reliable Internet connection. FAIL! One out of two does not a new computing paradigm make. We’re ever-so-close on the first, and miles away from the second. Switching to Chrome is not momentous, but it’s a change, so don’t do it 5 minutes before an important presentation. But do it ASAP. Once you make the switch you’ll understand why apps generally are overrated and the publishing app is dead. If you can do so much within a single app called a browser, why would you download and “learn” dozens of apps? They make sense on cellphones and for the time being on tablets. They’re just silly toys on real computers. 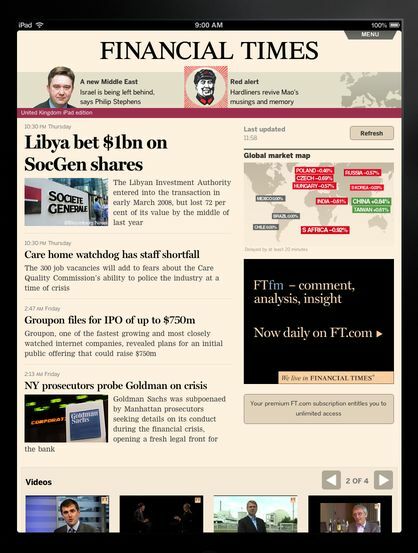 The new browser-based Financial Times "app" intrigues me. Apps have the same code overhead as browsers, and so are untenable both for developers and for users. Forget apps, publishers. Do you really want to develop software for Windows, Mac, Android, Chrome, Blackberry, Windows Phone, Kindle…and then support the revision cycles? Good luck. Apps are software – don’t let the short 3-letter appellation “app” fool you. App content will return to browser-based reading. But, they argue, both publishers and readers enjoy the most visually rich content. Readers like it for aesthetic reasons. Publishers see extra advertising dollars in rich content (accurately, one might add). Yes, they do. But a browser that’s trending towards full HTML5/CSS3 support is nearly as rich programmatically as most publishing apps. Sure, the business model demands greater ingenuity. But that surely is well-balanced by keeping Mr. Jobs from interfering with your business. June 24: For another take see Can OnSwipe convince media to go web instead of app? June 30: I wrote above that apps “make sense on cellphones.” I believe that they only makes sense on cellphones. 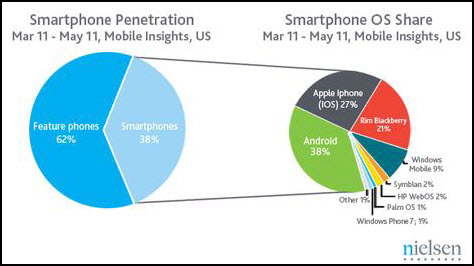 Right now if you want to get half-decent content onto a cellphone you essentially need to have an app (most sites aren’t mobile-optimized, so most users don’t bother checking them on the cellphones). The reason that apps work on cellphones is that they are well-optimized for cellphones ‒ there’s less data overhead than there would be for most browser-based content. And that’s important because the data download on most smartphones is still painfully slow ‒ nowhere near as fast as advertised. I don’t read those remarks as necessarily an endorsement of the browser over the app but rather as an acknowledgement of the current mobile bandwidth challenge and of the promising mobile future. July 25, 2011: Apple is providing a very compelling non-technical reason to abandon apps.